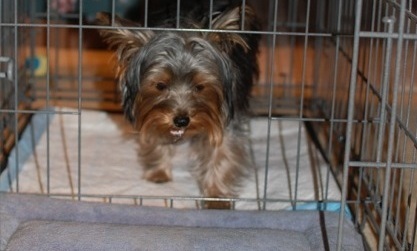 How to potty train a lowchen puppy with the Potty Training Puppy Apartment crate. We have lowchen house training solutions, so housebreaking lowchen puppies will be fast and easy. Over 50,000 dogs have been successfully potty trained with our world-famous indoor dog potty, called the Potty Training Puppy Apartment, including lowchens. The free video below is a short version of our free 15-minute video which is located on our Home Page. The training techniques and tips are being demonstrated by Miniature Pinscher puppies, however, the techniques are exactly the same for a lowchen puppy or a lowchen adult dog. Lowchen puppies are also known as little lion dog puppies. If you are seeking lowchen puppies for sale or adoption, please visit our Breeders page. At the bottom half of this page is specific breed information about the temperament and traits of a lowchen. If this breed is available in a teacup, toy or miniature size it will be mentioned below. The lowchen is a compact small dog, very slightly longer than it is tall, with strong, sturdy — but never coarse — bone. Its gait is effortless with good reach and drive, and it proudly carries its head and tail. Its coat is dense and long, moderately soft with a slight to moderate wave. It is traditionally clipped in a lion trim. The lowchen has a relatively short, broad top skull and muzzle, and its expression is alert, bright and lively. This is a lively, inquisitive, affectionate dog. It is a mixture of playful spirit and calm soul mate, a good companion for a quiet family. It is willing to please and responsive to commands, and it is devoted to its family. Some may bark or dig a lot. Lowchen (pronounced lerv-chun) means "little lion dog," and in France the breed is know as le petit chien lion. The lowchen shares common roots with other members of the bichon family, which includes the bichon frise and Havanese, among others. Germany, Russia and France have all laid claim to the breed. The exact time and place of its origin is obscure, but dogs resembling the lowchen, sporting the distinctive lion trim, can be found in 16th-century German art. In the traditional lion trim, the coat is clipped short from the last rib to, and including, the hindquarters down to the hock joint. The front legs are clipped from elbow to just above the pastern. The feet are clipped, and about half the tail is clipped, leaving a plume at the tip. Any long hair is to be left unshaped. In the 1960s, the breed's numbers had dwindled to perilous numbers; through the efforts of two breeders, several related dogs from Germany were brought to Britain. Because of their small numbers, these dogs were interbred extensively and formed the basis of the breed in Britain as well as America. The lowchen entered the AKC miscellaneous class in 1996 and was admitted as a member of the nonsporting group as of the first day of 1999.